In the overnight hours between Thursday, July 20 and Friday, July 21, 1944, the 384 Bomb Group prepared for Mission #163 to the Luftwaffe (German Air Force) Airfield at Schwäbisch Hall, Germany. Air personnel were awakened to begin their preparation process – breakfast, briefing, picking up flight gear and equipment, and assembly at their designated aircraft – as usual for each mission. But one navigator fell back asleep after being awakened. William Alvin Henson II was awakened at 0150 – that’s 1:50 in the morning. After the orderly who awakened him told him that breakfast was at 0230, Bill Henson fell back asleep. No one missed Henson or reported him missing until the pilot of his aircraft did so at engine time. 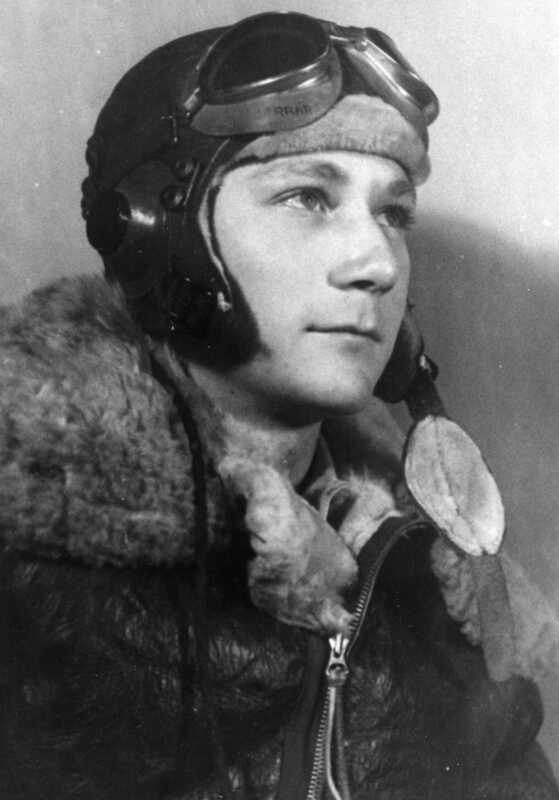 Pilot, Lt. Alfred H. Cole, who had recently been promoted from co-pilot to pilot of his own crew, called the tower. Cole’s usual navigator, Harry Simons, wasn’t assigned to Cole’s crew that mission and Bill Henson was to replace him. The tower advised Cole to taxi on time and he did so until he was nearly in takeoff position. Cole called again and was advised to wait in the dispersal area. Someone found Henson still asleep in bed and awakened him at 0620. Henson must have had to skip breakfast and hustle to operations to get his briefing materials, control points and maps, but didn’t receive a flight plan. He headed to the Tremblin’ Gremlin with the rest of the Cole crew aboard and waiting for him to take off. Henson arrived at 0645 and they took off at 0655. Henson had to put his navigation skills to work to search for the formation, but without success. The formation crossed the English coast at Felixstowe at 0821, altitude 15,000 feet, without them. By 0835, Cole realized they were not going to locate the formation and decided to turn back. They landed back at Grafton Underwood at 0954. Navigator is held responsible and will be required to fly an extra sortie to complete his tour. The Squadron duty operations clerk is also held partly responsible since he did not double check barracks. He will do night duty for one week. It is also felt that the Group Duty Navigator should have discovered that this navigator was not present at briefing. In calling roll at Navigators briefing, he should have discovered that this navigator was absent. 544th BS Operations Officer Major George H. “Snapper” Koehne, Jr. agreed with the abortion justification ruling. What did the punishment of flying one extra sortie (mission) for the simple act of falling back asleep mean for navigator Bill Henson? Well, if Henson had begun his tour earlier in the war, he would have completed his tour of duty of 25 missions on September 27, 1944 with the 384th’s Mission 200, and been sent home. As it turns out, on his 26th mission, Henson was aboard 43-37822 with my dad’s crew and was killed in the mid-air collision over Magdeburg. As horrific as the thought of dying because you fell back asleep is, that wasn’t the case for Henson. By the time Bill Henson was assigned to the 384th, the number of missions to complete a tour had been increased to 30, and he still had several more to go before he could return home. He did get awfully close, though. I was awakened at 0150. The orderly told me that breakfast was 0230 so I went back to sleep and was awakened a second time at 0620. Came to operations and obtained control points and necessary maps but no flight plan. Went to ship and took-off as explained by pilot. Gave heading of 130° in order to meet formation at Splasher # 7. Couldn’t get Splasher # 7 on radio compass. Circled in what I thought was apparent area of Splasher # 7. Saw balloon barrages at approximately 0800 and realized we were sout[h] of London. Gave heading to Felixstowe and arrived there approximately 0830 and realized formation had left. Plane was equipped with gee box but on my first gee fix plotted west of Northampton, so I thought it was inoperative. Later fixes proved to be correct. Request all responsibility of abortion. At engine time the navigator had not yet arrived. I called the tower and was advised to taxi on time – I taxied until nearly in take-off position at which time I called Cherub again and was told to wait in Dispersal #46. The navigator arrived at 0645 and we took off at 0655. At 0835 we had not yet located the formation and it became apparent that were not going to find it. I decided to turn back. I have previously written several articles about the WWII Black March, the march of prisoners of war of Stalag Luft IV across Germany in the winter of 1945. Today, I want to explain a very important aspect of that march, the Combine. But first, as a refresher to the Black March itself, please refer to this previous post. It is the proclamation entered into the Congressional Record on May 8, 1995 by WWII veteran, Congressman John William Warner. Congressman Warner was approached by three WWII veterans who were on the march and who brought this piece of WWII history to his attention – Cpl. Bob McVicker of Alexandria, Virginia; S. Sgt. Ralph Pippens of Alexandria, Louisiana; and Sgt. Arthur Duchesneau of Daytona Beach, Florida. Rep. Warner wanted to tell their story and raise awareness of what the Stalag Luft IV prisoners endured on this little-known march in pursuit of freedom. In WWII, my dad, George Edwin Farrar, was a waist gunner in the 384th Bomb Group based in Grafton Underwood, England. His B-17 went down on September 28, 1944 and after a lengthy hospital stay, he was put in Stalag Luft IV. On February 6, 1945, he was one of the prisoners from Stalag Luft IV who were marched out of the camp in several columns accompanied by German guards armed with rifles, and guard dogs. For Dad, the Black March lasted the full eighty-six days, covering approximately five-hundred miles. From an old letter, I determined that the two men closest to my dad in the prison camp and on the Black March were the author of the letter, British airman Laurie Newbold, and American airman Cecil McWhorter. Newbold’s letter adds much to what I know about who shared my father’s WWII experiences, especially these two sentences. Have you ever come across any more of Room 12. Old Mac Whorter lives down south at East Bernstadt, N London, Kentucky but I forgot that your states are as big as England. A combine usually consisted of three Kriegies, sometimes two, sometimes four, but the most logical number combination was three. Further explanation will confirm the logic of three men versus two or four men. Of all the reasons for a three man combine, there is no one reason to justify this combination, there are many reasons. As stated before, we each had two blankets, and with a combination of three Kriegies this gave us six blankets. After our arrival at a barn we would stake a claim to an area in the barn according to our arrival. First-in claimed the advantageous areas, usually near an exit. Since we shared our food, it was imperative that we should stick together; but we usually marched in columns of fours and it always presented a problem at the end of a [day’s] march, when the guards would count off 150 or 200 Kriegies for one barn. This would usually split a combine. One hell of a lot of shuffling went on to get the combine together again. When trading, bartering or stealing detail; the other two would construct our bed of straw for the night. Our bed of straw was covered with the three German blankets, two lengthwise and one across the bottom and tucked in. The three GI blankets would cover us along with our GI overcoats. The mention of trading, bartering, and stealing references the fact that the men had very little food and clean water on the road. They often attempted to supplement their meager rations by trading items like the watch my father traded for a loaf of bread, or stealing potatoes or chickens from the farmers in whose barns they slept. The combines walked together, all day, every day, sometimes as far as twenty miles in one day. They shared food and ate together. They slept together and shared body heat in the unheated barns and under the stars in the sub-freezing temperatures of the winter of 1945. When one felt weak, the others helped him put one foot in front of the other, to take one more step, to keep up with the column. Falling behind the group meant the risk of being shot and left for dead beside the road as the group trudged forward. The combine gave the men someone to lean on in more ways than one. How many men died on the march is not known. It is truly a miracle that any of them survived. They were covered in lice, were afflicted with dysentery and other diseases, and were close to the point of starvation. They have been described as walking skeletons. Thoughts of home and the support of each other must have kept them going. I never saw you again after the day we were liberated. I understand that nearly all your boys stopped the first night at Boizenburg but most of the RAF went straight on to Luneburg & I got there that night. From there I went to Emsdetten near Holland & then flew to England in a Lanc [possible abbreviation for Lancaster bomber]. Well George I expect I could write all night about the past but most of that’s best forgotten, don’t you think. Is the past and that piece of history best forgotten? When I read pages from Joe O’Donnell’s Shoe Leather Express and read Laurie Newbold’s letter, their words trouble me. They unsettle me. It disturbs me deeply to know these things that my father endured. Things that he himself could not or would not tell me. I understand, at least I think I do, why he wouldn’t divulge these things. I was too young. I was too innocent. He did not want to burden me or anyone else with this horrible knowledge. My father was right in not telling me. I should not know these things because as I’ve learned, now that I know them, I cannot un-know them. They rattle around in my head and pop to the surface at unexpected moments. These things that were a part of him, they are now a part of me. Not to the extent they were for him, of course, because he actually lived them and I only learned them. I cannot imagine the way the horrific memories crashed upon his shore of existence every single moment of every single day of the remainder of his life. These are things that no being should ever have to endure. But at that time in history there were people who looked much like the rest of us, who underneath that layer of human-like skin were not human at all, but monsters. When I was young, monsters lived under my bed and in my closet. I had to take a long-jump into and out of bed so the monster wouldn’t grab my feet and pull me under into a certain horrible death. I had to jump back when I opened the closet door so the monster inside couldn’t grab me and drag me in. My monsters vanished over time. They probably tired of not being able to catch me and moved on to the bed and closet of another child. But my father’s monsters never left. He died thirty-seven years after his time in the prison camp and Black March were over. Dying was the only way to end the war for him and banish his monsters. The Preface and first two chapters of Joseph O’Donnell’s The Shoe Leather Express may be read courtesy of Joseph O’Donnell and Gregory Hatton here. I previously wrote about Buslee crew ball turret gunner Erwin Vernon Foster in this article. However, after visiting the National Personnel Records Center (NPRC) in St. Louis, Missouri, I found some additional information about him. In his personnel file at the NPRC, I found several forms relating to Erwin’s service in the Air Force Reserves after WWII and his active duty in the Korean War. They are also a window into what Erwin did for a living, as he had to fill out employment information on several forms. For instance, Erwin noted he was in auto sales for three months, roofing and siding sales for a home improvement company for seven months, and in office equipment sales for Pitney-Bowes, particularly mailing machines, for one month. As a reservist, Erwin filled out a form for a voluntary application for recall of USAFR Airmen to Active Duty on July 8, 1950, volunteering for a 12 month tour in the Korean War. At the time he was living at 15 Park St. in Oswego, NY, was married and had a child. Forms that Erwin signed on December 4 and 5 of 1950 in Fort Dix, New Jersey – apparently as he was re-entering active duty – indicated quite a bit of personal information, too. His home address was 452 W. Church St., Elmira, New York (his mother’s home). He was born in Horseheads, New York. He weighed 150 lbs and was 5’6” tall. His wife, Virginia S. Foster, was 26 years old. He had a three-year old daughter. His mother, Mary C. Smith, was 56 years old. Ruth Carpenter was an aunt living at 454 W. Church St., Elmira, New York (right next door). His father was deceased, having died at 30 years old of meningitis. In 1934 at age 14, Erwin had had an appendectomy in Elmira. In 1944, while in England, Erwin had jaundice. His military address was 306th Bomb Group, 368th Bomb Squadron. At Elmira High School, he played football. He considered his main occupation to be Salesman, retail, selling postal machines (stamping). His employer was Pitney-Bowes, Inc of Stamford, CT. At the time he filled out the form, he had been doing this for 1 month. He considered his second best occupation to be an embalmer for 8 years, working for himself. His last date of employment at this occupation was October 1950. In this job, he made arrangements for and conducted funerals. He attended such details as selection of coffin, site, flowers, adjusting of lights, transportation, etc. He did embalming work. He worked at this occupation from 1939 – 1942 and 1946 – 1950. His listed an additional occupation or hobby as hunting. The dates of his last civilian employment were July 1949 to October 1950 as a self-employed Funeral Director. His original induction date into the military (in WWII) was November 28, 1942. His date and place of entry into active service in the Korean War was December 1, 1950. During the Korean War, Erwin’s most significant duty assignment was the 305th Air Refueling Squadron, 305th Bomb Wing (M), MacDill Air Force Base, Florida. He was in Operations. On October 22, 1951, he was granted Top Secret Clearance (only a month before his release). On November 29, 1951, Erwin Foster received an honorable discharge and was released from assignment with the 305th Air Refueling Squadron, 305th Bomb Wing (M), MacDill AFB, Florida. At that time, he transferred back to the Air Force Reserves. On July 26, 1953, Erwin was discharged from the Air Force Reserves. Like Buslee crew top turret gunner, Lenard Leroy Bryant, Erwin must have washed out of radio school before going on to become an aerial gunner. Erwin’s wife and child must have gone to live with his mother in Elmira, New York while he was on active duty in the Korean War. Ruth Carpenter, who showed up living with Erwin and his mother along with her own son, in earlier census records was still living close to Erwin’s mother (right next door). Ruth’s son, Raymond, was three years older than Erwin. Erwin’s father died at 30 years old of meningitis. In WWI, he served on the USS Guantanamo from October 9, 1918 until the end of WWI on November 11, 1918. Navy records show that he died on March 10, 1921. It is unclear if he was still serving with the Navy at the time. Erwin was only one year old when his father died. In 1944, while in England, Erwin had jaundice. This is one of the most interesting pieces of information for me in Erwin’s personnel file. I had been wondering why he missed so many missions with the Buslee crew in September of 1944. I believe this could be the reason. Fortunately for him, he was unable to fly on the September 28, 1944 mission to Magdeburg where the Brodie crew’s B-17 collided with the Buslee crew’s flying fortress. As a result, Erwin was able to finish his thirty-five required missions to complete his tour and return home. Erwin Foster was one of only three of the original Buslee crew members to complete his missions without being killed, seriously wounded, or taken prisoner during WWII. I don’t understand his mention of the 306th Bomb Group, 368th Bomb Squadron as his military address on one form although I supposed it could have been his designation during his Air Force Reserve duty. Now I have some more Buslee crew NexGens to search for: Erwin Foster’s daughter, who would be in her early 70’s today, and descendants of his cousin Raymond Carpenter. 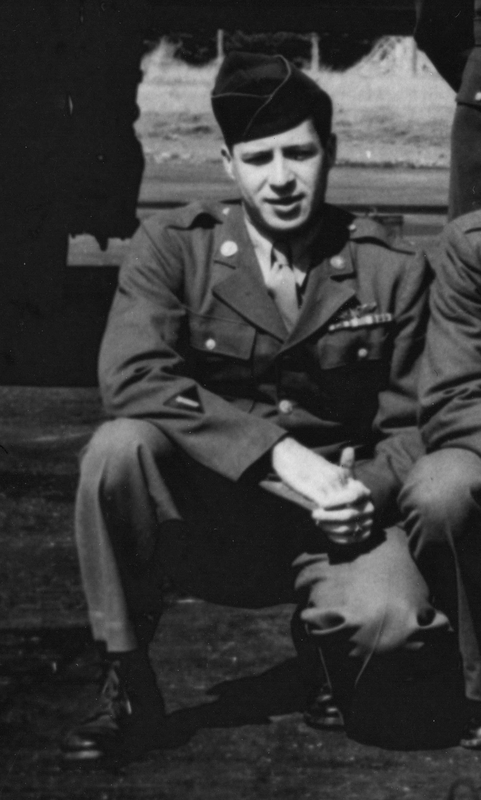 I started this blog when I started researching my dad’s WWII history, including his training, but mainly focused on his service with the 384th Bomb Group and his mid-air collision on September 28, 1944. By delving into the actions of the 384th Bomb Group, I have found many interesting stories and fascinating people. As much as I enjoy researching them, I find I have wandered very much off the subject which I originally intended to explore. I will also study what the world was like during WWII and the years leading up to the war and what life was like during that time period for the people who lived through it. I don’t think I can fully understand the people I’m researching until I understand their time period, which was so different from ours. The actions of the men who experienced that war still echo through the thoughts of those of us who descended from them or their brothers and sisters. But it is difficult to comprehend for many of us living in today’s very different world what it truly meant to fight in that war. Today we can take a ride as a passenger in a B-17, as quite a few of them tour the country. But that is a fun ride in the clear skies at low altitude over a piece of beautiful American countryside. We cannot know, no matter how good our imaginations are, what that ride would have been like in the cold of 25,000 feet with no oxygen, with German fighters bearing down, or flak exploding into the belly of the plane. We cannot fully imagine the excitement or the terror or the sadness that those men felt mission after mission after mission. I need to know. I need to piece the picture together bit by bit until I can see it more clearly. My dad is no longer around to tell me his war stories and even if he were, I don’t think I could ever completely know what it was like without living through it. By talking with men who served in the 384th, and reading books and watching documentaries and movies about the war, I have developed a picture in my mind. But that picture is not, and never will be, complete. The edges are fuzzy and holes remain in the middle of my picture. I’ll just keep piecing it together, looking for new information and gaining a better understanding. It’s been an interesting journey so far. On June 6, 1994, the French government commemorated the 50th anniversary of D-Day (the invasion by the Allied forces of Normandy on June 6, 1944) by distributing the French Jubilee of Liberty medal to U.S. veterans who participated in the Normandy campaign. The medal was first awarded to American servicemen for their participation in the Battle of Normandy. They were minted at the request of the Regional Council of Normandy to be presented to the veterans attending the 50th anniversary of the D-Day landing. Eligible veterans included those who served in the Normandy campaign from June 6 to August 31, 1944, and were part of the of land forces, off-shore personnel, or airmen flying overhead. The first medals awarded were those presented in the anniversary ceremony to the veterans attending. 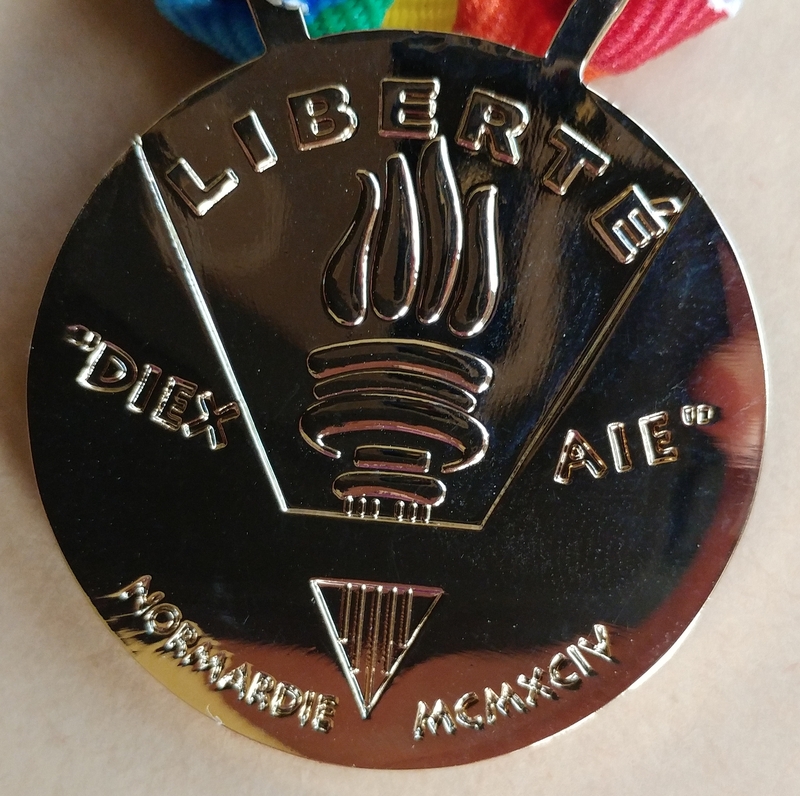 The French government no longer awards the Jubilee of Liberty medal. However, they have granted the 8th Air Force Historical Society approval to mint and distribute the medal to eligible veterans or the families of eligible deceased veterans who qualify for the award. A certificate accompanies the medal. 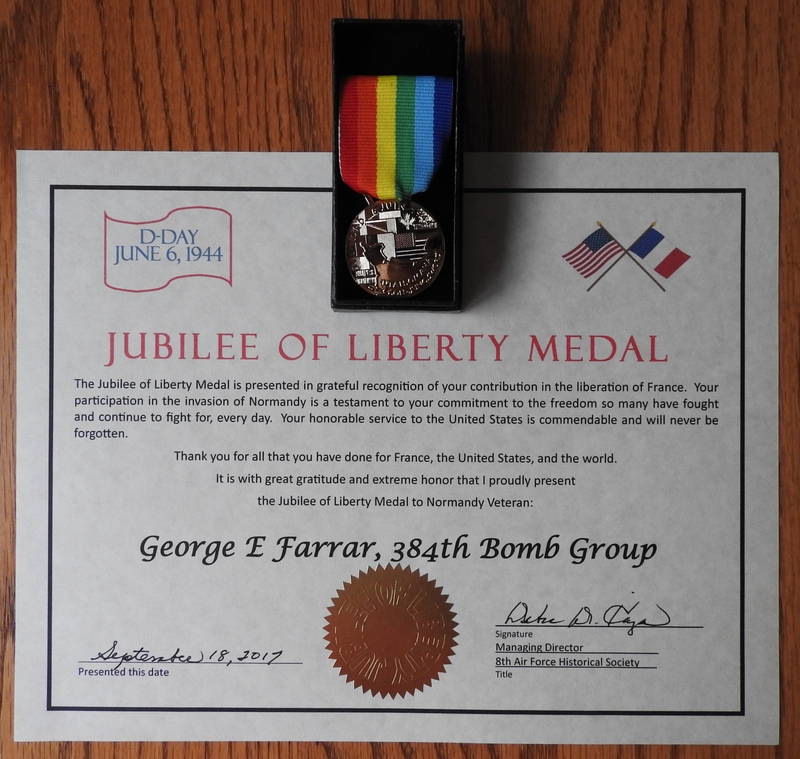 The Jubilee of Liberty Medal is presented in grateful recognition of your contribution in the liberation of France. Your participation in the invasion of Normandy is a testament to your commitment to the freedom so many have fought and continue to fight for, every day. Your honorable service to the United States is commendable and will never be forgotten. Thank you for all that you have done for France, the United States, and the world. The front of the medal is inscribed with “Overlord 6 Juin 1944” on the upper part of the medal, with the flags of the Allied nations and the names of the landing beaches completing the face of the medal. The reverse of the medal shows the Torch of Freedom surrounded by the device of William the Conqueror “Diex Aie” (“God is with us” in Norman French). Dad, George Edwin Farrar, participated in the Normandy campaign with the 384th Bomb Group in August 1944, which made him eligible for the award. I applied for the Jubilee of Liberty medal for him as soon as I found the application instructions in the September 2017 issue of the 8th Air Force News. 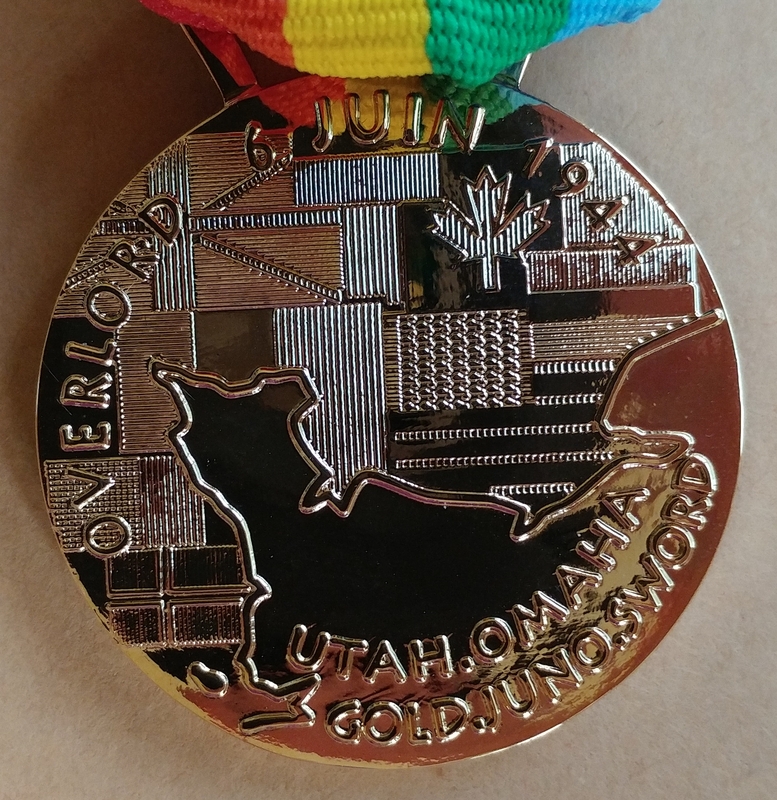 As I hold this medal in my hand, it becomes more than metal and ribbon. It is a reminder for me of my dad’s service to our country and his fight for not only our freedom, but France’s and the free world. My dad flew sixteen missions with the 384th Bomb Group of the 8th Air Force in WWII, but the only mission location he marked on this Invasion Map of Europe in his World Atlas was Magdeburg, Germany. It was the only mission he told me stories about, the one where another B-17 collided with his and he lost all of his fellow crewmates on that ship that day. Am very sorry I can’t give more information, but our ship was hit by another B-17 from our group. The other ship must have hit right in the center of our ship, as we were knocked half in-to. At the time we were struck I was knocked unconscious, and fell about 25,000 feet, before I knew I was even out of the ship. Never saw any of the other boys. I received a little rough treatment from the Germans when I hit the ground, and was unable to tell where I was. 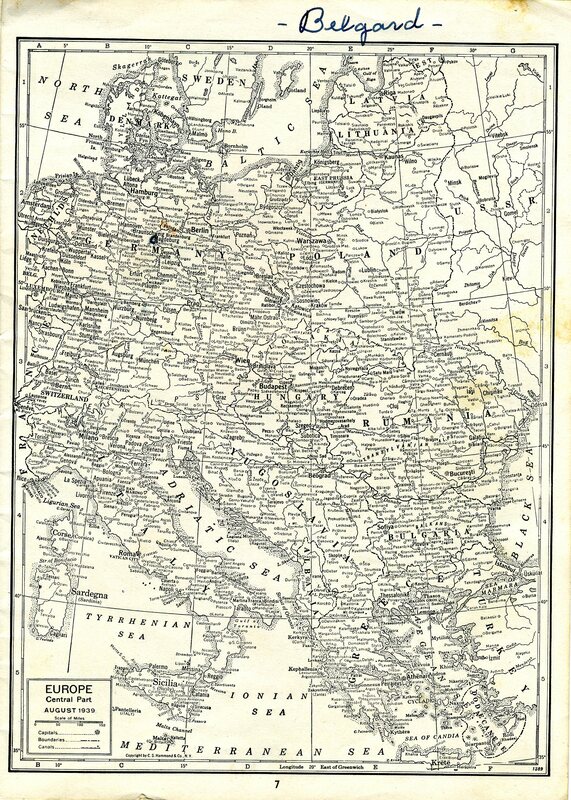 He also marked Magdeburg on another map in his World Atlas and wrote “Belgard” in the top margin. Belgard, or Bialogard, is the county in which Gross-Tychow (now Tychowo), Poland lies, home of Stalag Luft IV. Stalag Luft IV in Gross-Tychow was where Dad spent the darkest days of his life. It was one of the worst WWII prison camps in Germany, where prisoners were mistreated and underfed. It was the camp from which prisoners were marched in early February 1944, in one of the worst winters in Germany’s history, until their liberation in late April/early May. These places, Magdeburg and Belgard, these two places on his map, would be burned into my father’s memory and soul forever. He would never return to those places for the rest of his life, but the memories of them remained with him every day and every night. I am drawn to these places and I hope one day I will visit both. Neither look the same today as what Dad experienced in 1944, but I wish to stand on the soil where he hit the ground in his parachute, where his B-17 crashed to earth, and where he was held a prisoner behind barbed wire. I would like to walk the roads he marched as a prisoner of war by day, and see the barns where he slept in the hay at night. Why do I want to visit these sites? Dad would probably not want me to see these places he would like to have forgotten, but they were an important part of his history and that makes them an important part of mine. I imagine seeing these places will take my breath away and bring me to tears. I lost Dad almost thirty-five years ago. He died at the age of sixty-one. His heart gave out when he was too young to leave us. The mid-air collision and his subsequent time as a prisoner of war are what killed him. But he was tough and it took him another thirty-eight years to die. I would like to have had him around for another thirty years or more, so he could watch my sister and me mature, walk us down the aisle, and hold his grandchildren. But I understand now that the only way he found peace from the war was to leave this life and those horrible memories behind. Rest in peace, Dad. I will never stop loving you. 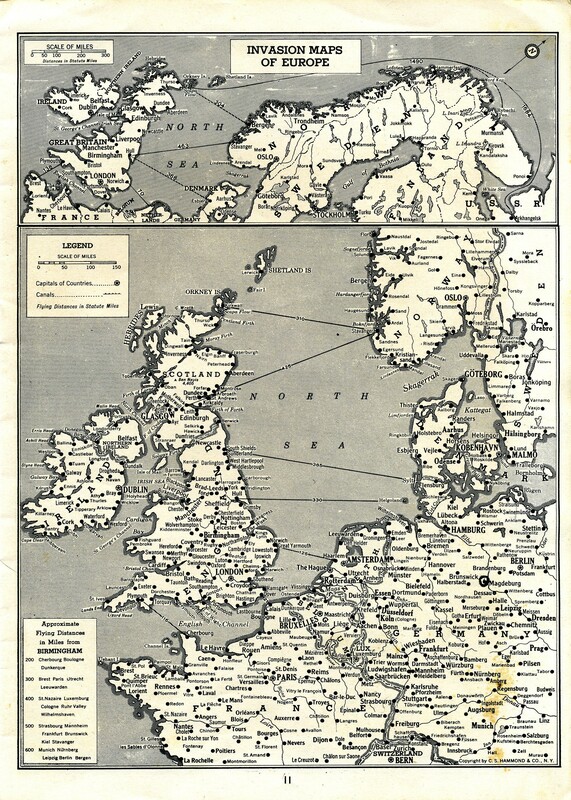 One of the maps in my dad’s World Atlas showed his route from the US to the UK and then on into Germany. I believe the starting point in the US was Kearney, Nebraska, where he and the Buslee crew picked up their B-17 to ferry across the Atlantic. On his way out of Ardmore, Oklahoma, he wrote about his expected stay in Nebraska in a letter to his mother dated June 22, 1944. We will be at the next place just long enough to get our plane. It should take from three to seven days. Dad must have made a few stops between Kearney and the East Coast of the US. On June 25, he wrote to his mother again. Just a line to let you know that everything is fine. There is no use in you writing me here, as we will only be here four days. We have our own plane, and will fly over. We should be there next week this time. It only has twelve hours on it and guns all over it. They are giving each of us a cal. – 45 pistol and a large knife. You would think we were going to look for a fight. Please don’t worry about me as I know what I am doing, and love it. Daddy wrote to his mother again the next day, June 26. One more day in this place, and we will be going. In just a little while and we will be on our way. I wish I could tell you where to, but it just isn’t being done this season. I can tell you we will stay once more in the States, and I will try to drop you a line from there. I am in the ship now. We have everything packed, and we are taking time about watching it until take-off time. This is one of the best places I have been in some time, and I hate to leave it without going to town once more. According to his separation documents, my dad departed the US on July 1, 1944 and arrived in the ETO (European Theater of Operations) on July 3. There were three air bases in the Northeast involved in ferrying aircraft to the ETO – Grenier Army Air Base in New Hampshire, Presque Isle Army Airfield in Maine, and Dow Army Airfield, also in Maine. From the spot marked on his map, I believe Daddy’s last stop in the US was Grenier Army Air Base in Manchester, New Hampshire. From there, most ferried aircraft next went to RCAF Station Gander, Newfoundland until mid-1942, when a change was made to Goose Bay Labrador. Sure enough, Dad marked the location of Goose Bay on his map. 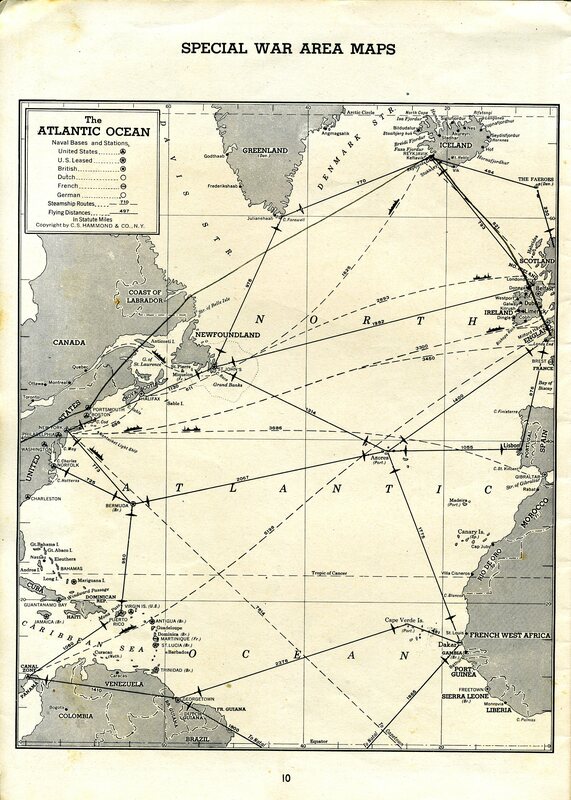 There were three aircraft ferrying stops in the North Atlantic Route in Greenland, Bluie West 1, Bluie West 8, and Bluie East 2, but Daddy didn’t note a stop in Greenland. The next stop Dad noted on his map was on the East coast of Iceland. There were three airfields in Iceland used on the North Atlantic Ferrying route: Meeks Field, Patterson Field (originally Svidningar Field), and Reykjavik Airport. Reykjavik Airport and Meeks Field appear on the map on the West coast of Iceland. I can’t locate Patterson Field on the map. He must have stopped in Iceland, but I am not certain of the exact location. Next stop must have been the RAF Valley in Wales in the UK, judging from the location Dad marked on his map. Sixty to seventy ferried aircraft arrived there each day, then were forwarded to the operational bases in England of the 8th and 9th Air Forces. From there, Dad marked a route across England to his home base in Grafton Underwood, and then continued the route deep into Germany. I know the location of his final mark. It would be Magdeburg, where high in the skies above Germany, another B-17 of his own Bomb Group would collide with his B-17 on September 28, 1944. Another map included in the Atlas showed some various routes to the ETO. Dad marked one spot on his Atlas map of Great Britain and Ireland, his home base in Grafton Underwood. (I added the arrow and red outline). Station 106 at Grafton Underwood was the home of the 384th Bomb Group, from which my dad flew his missions in WWII. While trying to piece together my dad’s timeline during his WWII service, I decided to dig through his box of WWII letters and memorabilia again. 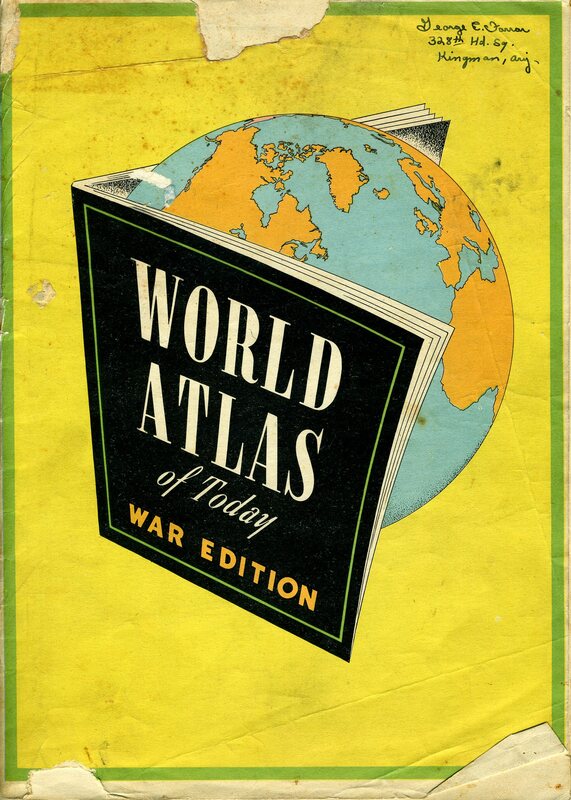 I ran across this treasure, “World Atlas of Today – War Edition.” I know I have thumbed through it before, but I did not remember my dad’s annotations I found on its cover and within it. With the whole of the globe the scene of the greatest upheaval since the birth of man – Maps – clear and accurate maps are absolutely indispensable to enable one to grasp the vast scope of the present world shaking conflict, and to form an appreciation of the tremendous distances involved. Remember, this was a time before jet airliners and cell phones. Travel to distant places took much longer and news from those faraway places took longer, too. 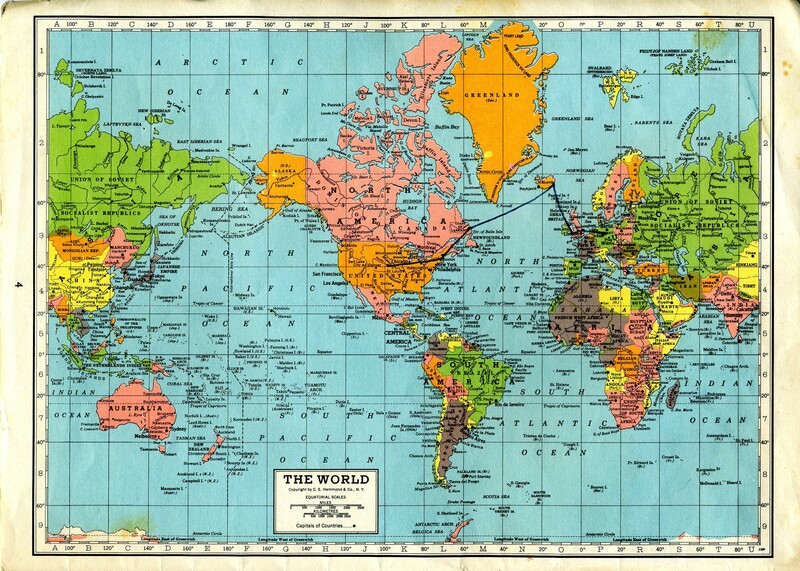 But my dad went to those faraway places and in the pages of this volume of maps, he recorded his travels, and in doing so recorded his history. Dad wrote his name and station on the cover, George E. Farrar, 328th Hd. Sq., Kingman, Ariz. I know he was stationed with the 328 Hd. Sq in May 1943, so that’s probably about the time he received this atlas. Other than Kingman, I know Dad was in Albuquerque sometime between October 12 and December 18, 1942 as those were the dates a movie crew was in Albuquerque filming the movie “Bombardier.” Dad was there as part of the 383rd Student Squadron at Kirtland Army Air Base. I know this only from his notes, as his separation documents don’t list Albuquerque as a place he was either a student or instructor. As for Kearney and Grenier, he and the Buslee crew picked up their B-17 in Kearney and I believe Grenier Army Air Base was their final destination in the states on their way to ferry their B-17 across the Atlantic. I don’t know the significance of these cities other than his hometown was Atlanta, Georgia, and he attended AC Instructors School in Fort Myers, Florida for six weeks. I also don’t understand the significance of the red lines vs. the black lines. Perhaps the lines were routes he traveled, possibly red by train and black by plane. 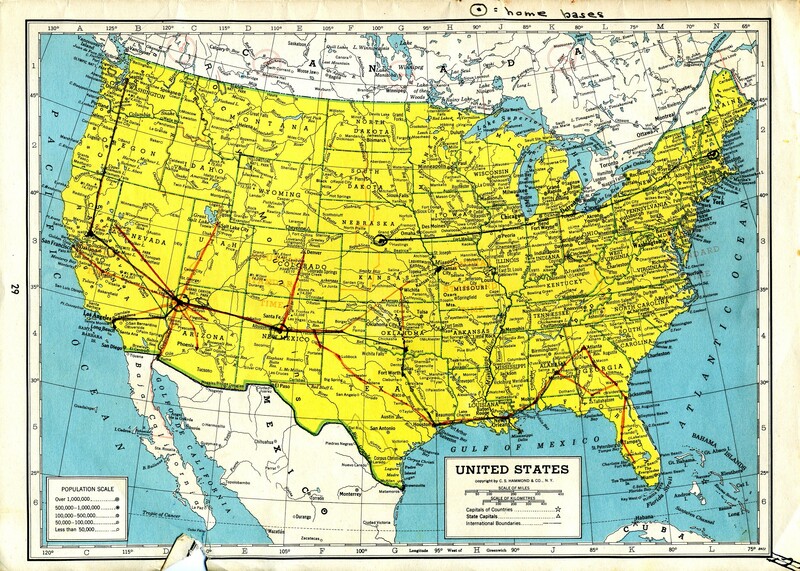 The lines emanating from Kingman and Albuquerque could have been training flight paths. 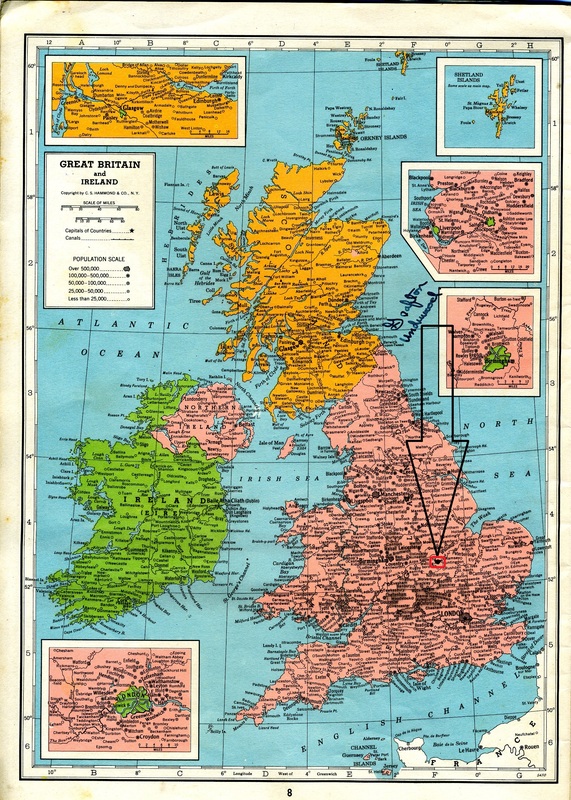 As I discover more information, perhaps one day I will better understand Dad’s annotations on his maps. …with a map showing his route to the ETO in more detail.